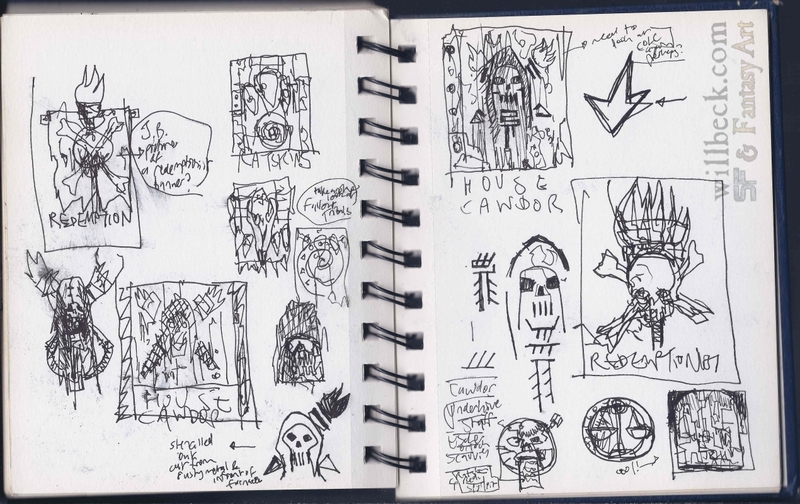 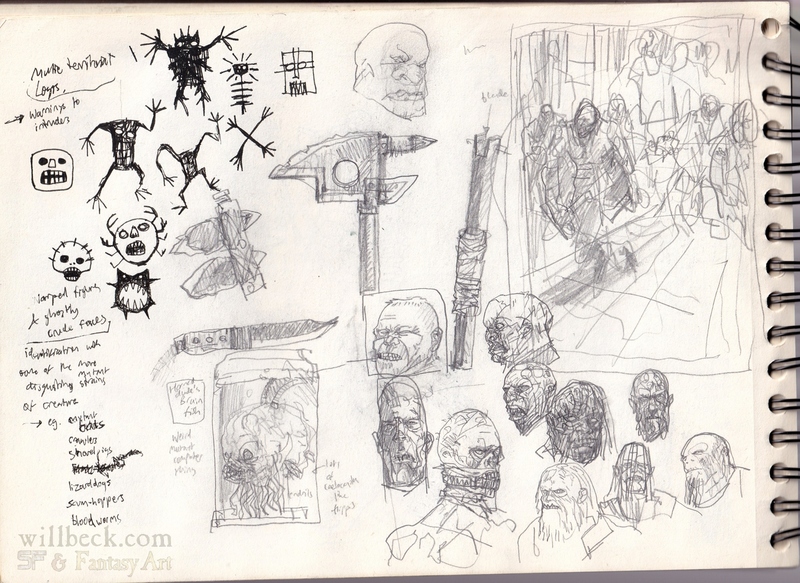 Here are the last few pages of my Underhive sketchbook. 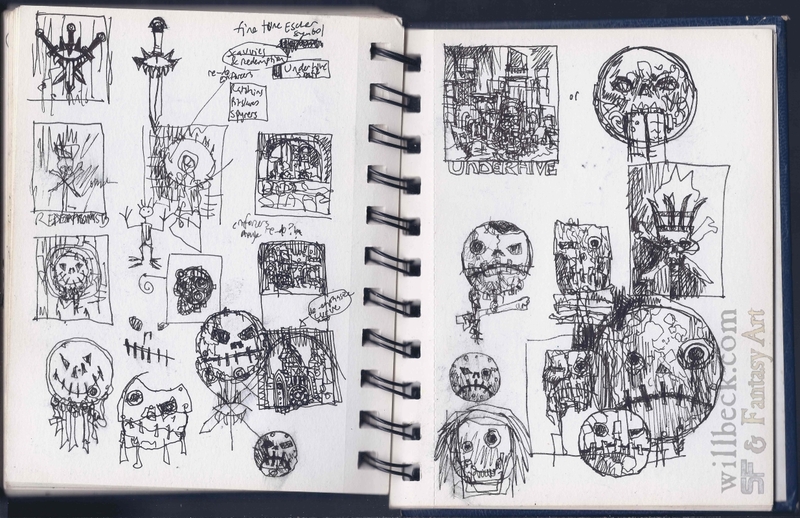 The Redemptionists symbol is about right, still working on the Spyrers and Ratskins symbols with a dessicated Ripperjack as a gruesome option! 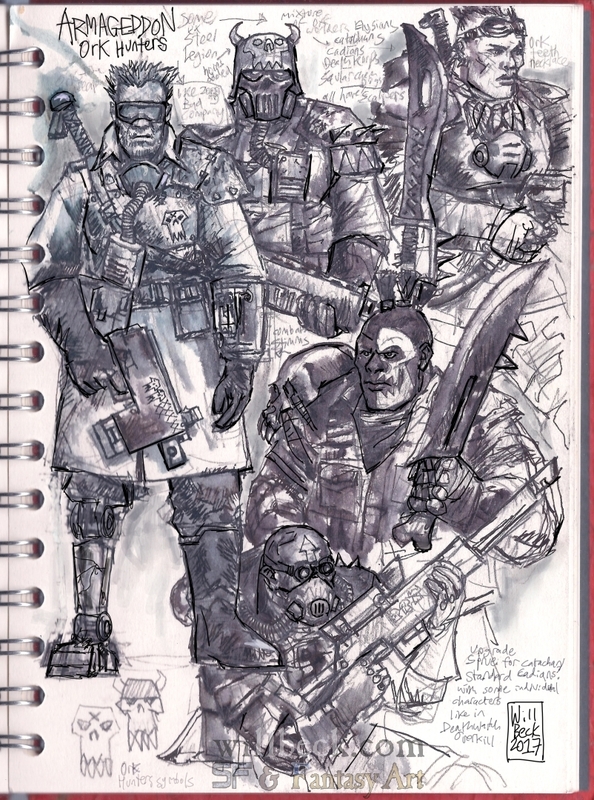 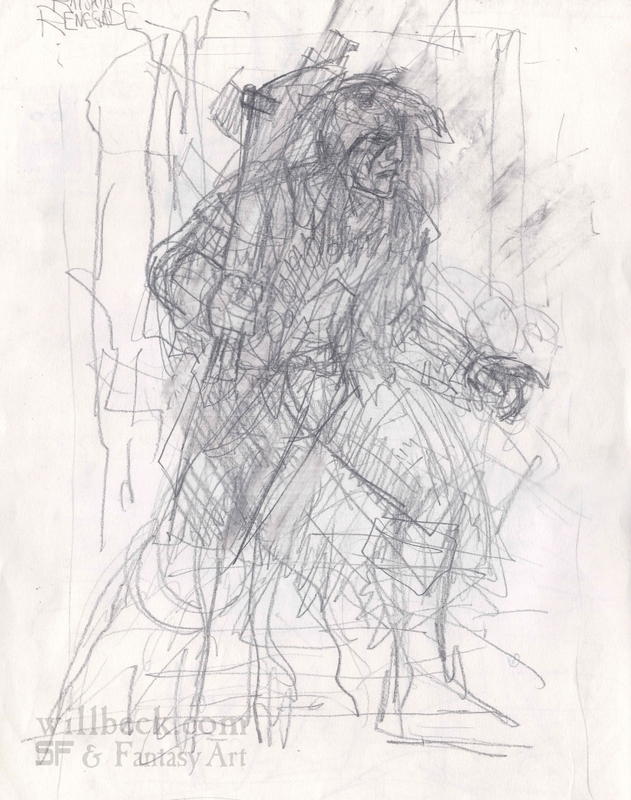 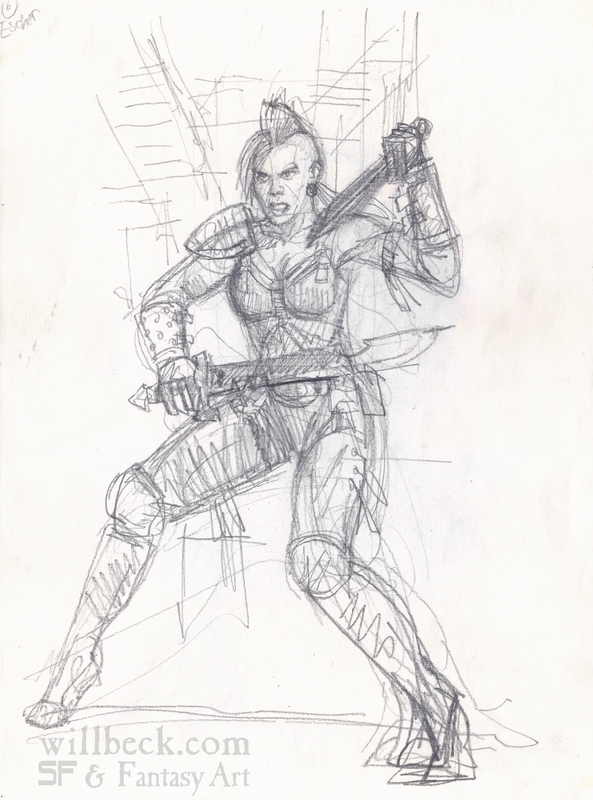 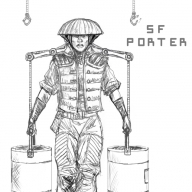 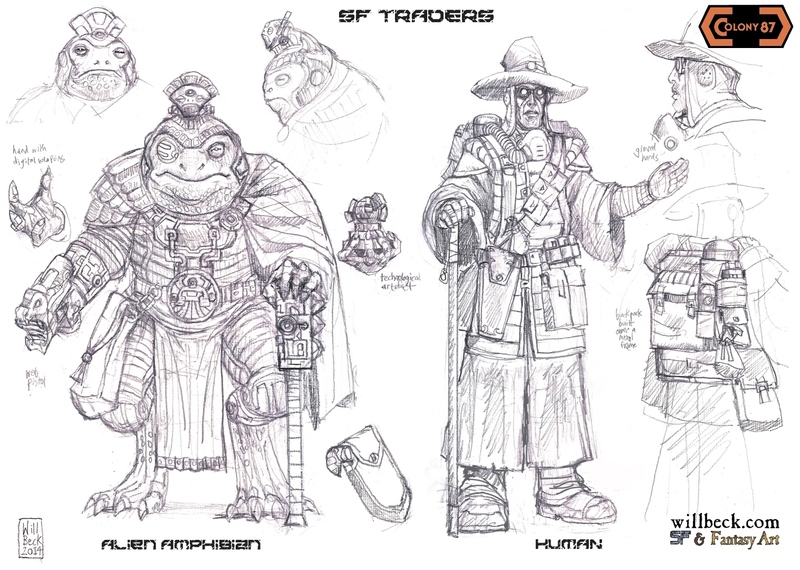 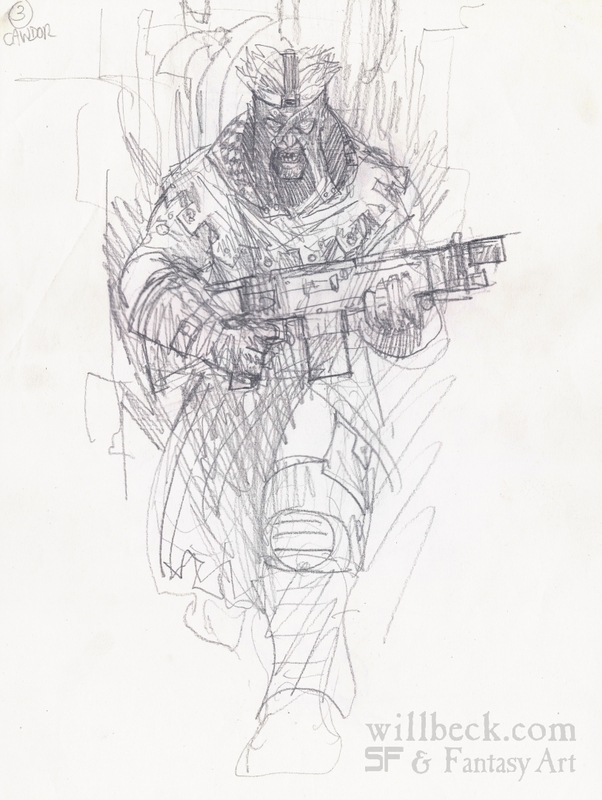 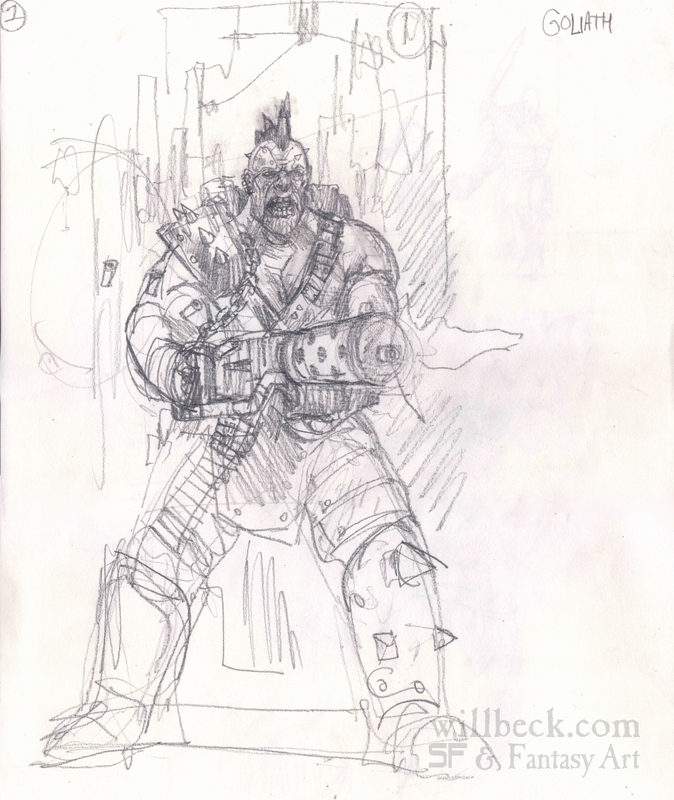 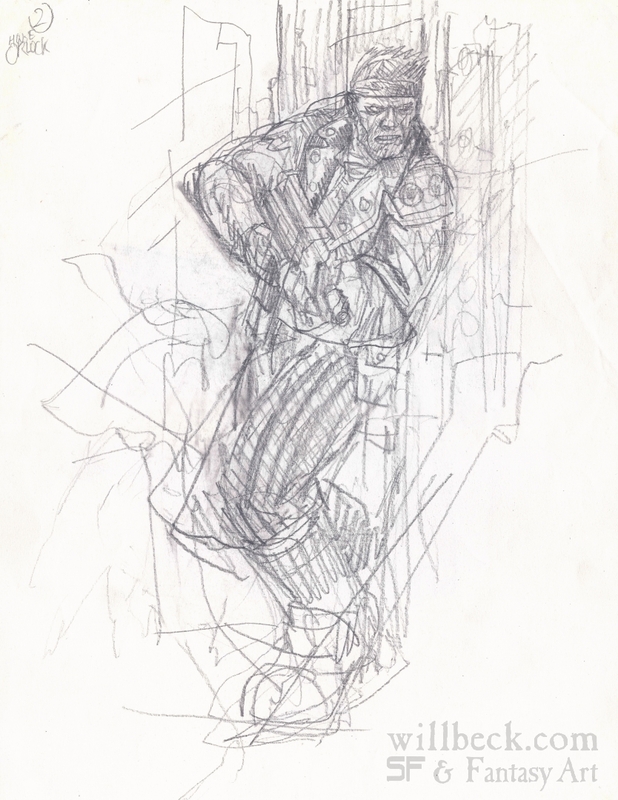 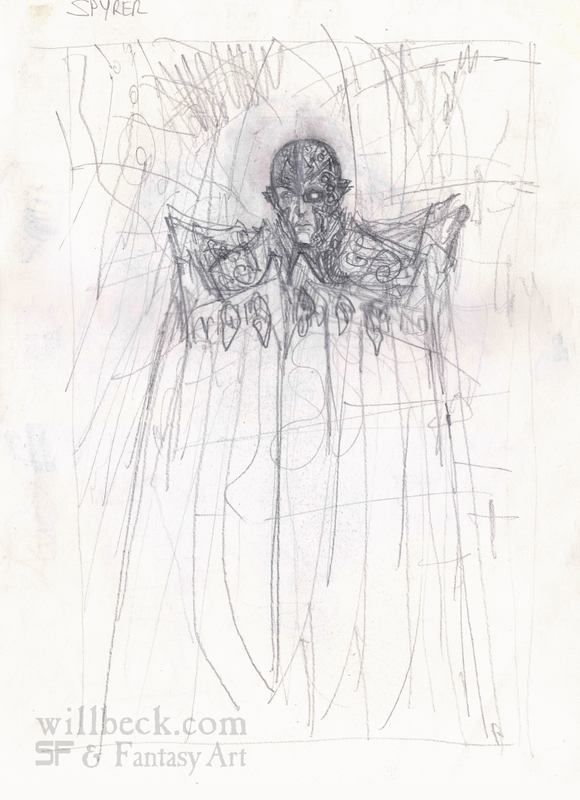 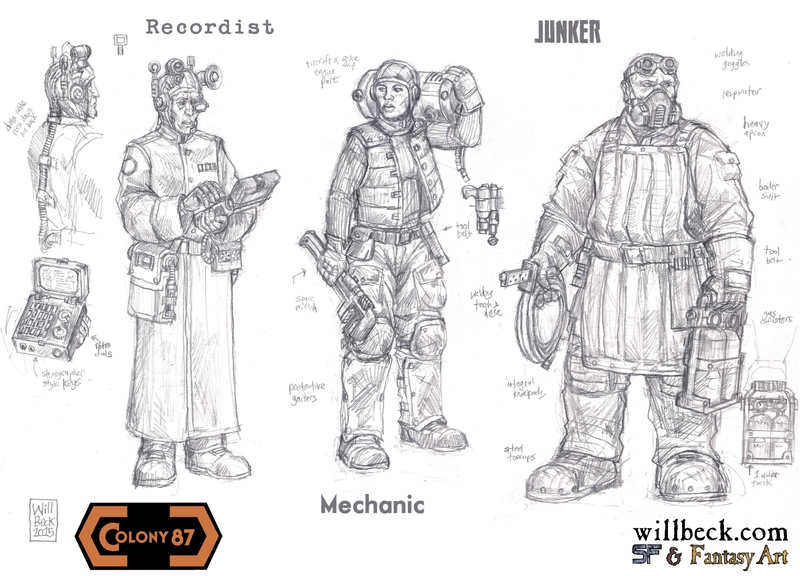 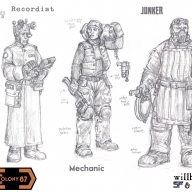 That’s all from my Underhive Sketchbook, though I have the original pencil character drawings of all the gangers to show. 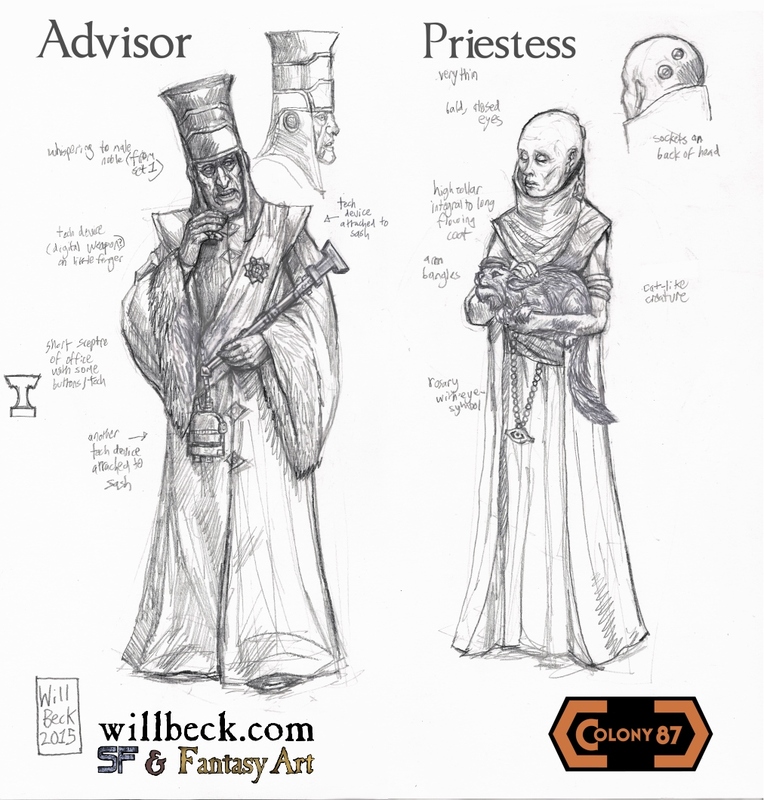 As allways this is Games Workshop’s intellectual property, just ‘fan art’ and not intended to get up the noses of their legal team. 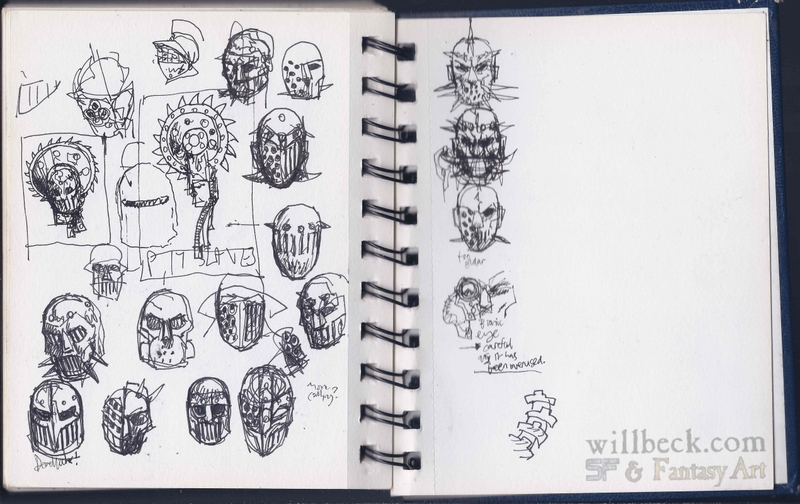 Continuing my Underhive sketches and doodles. 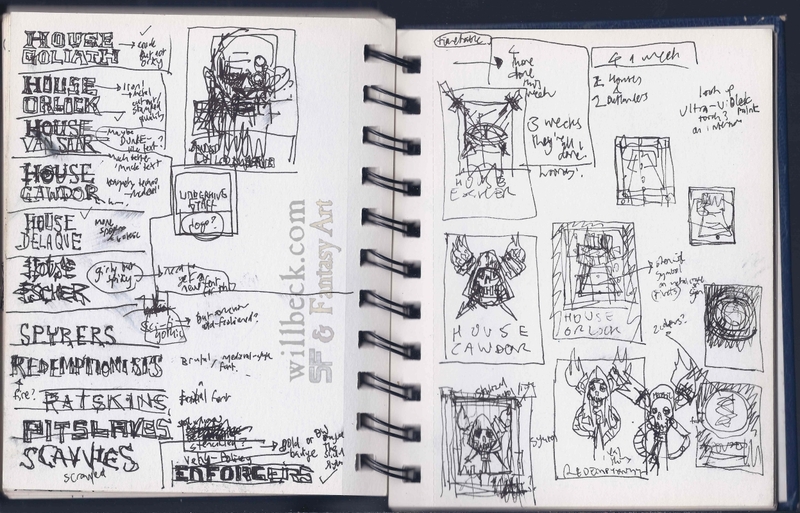 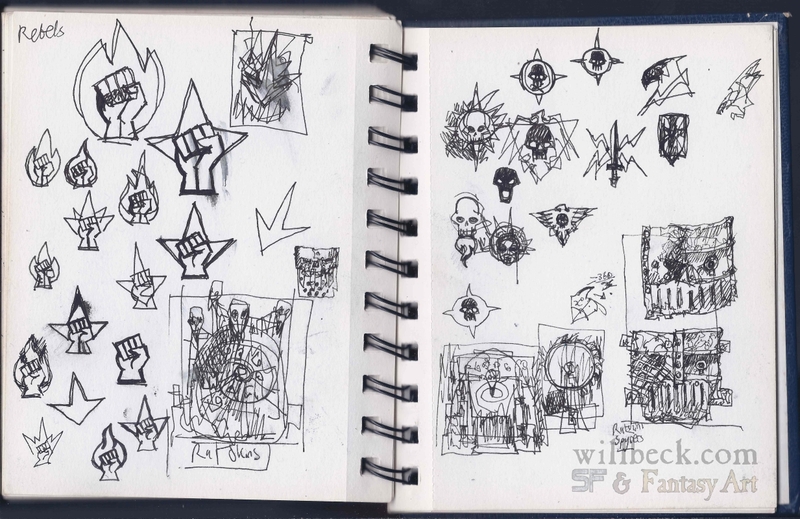 My process for creating the symbols for all of the Necromunda gangs are next; font and colour ideas followed by thumbnail sketches. 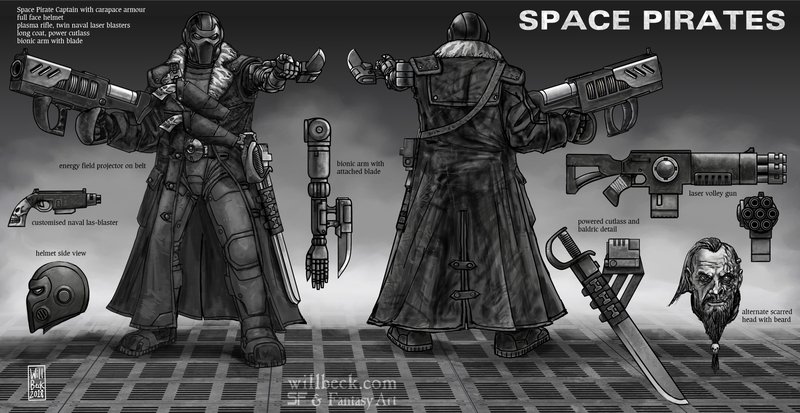 The miniatures look to be a larger scale than before and I wonder if many of the rest of the 40K range would be compatible. 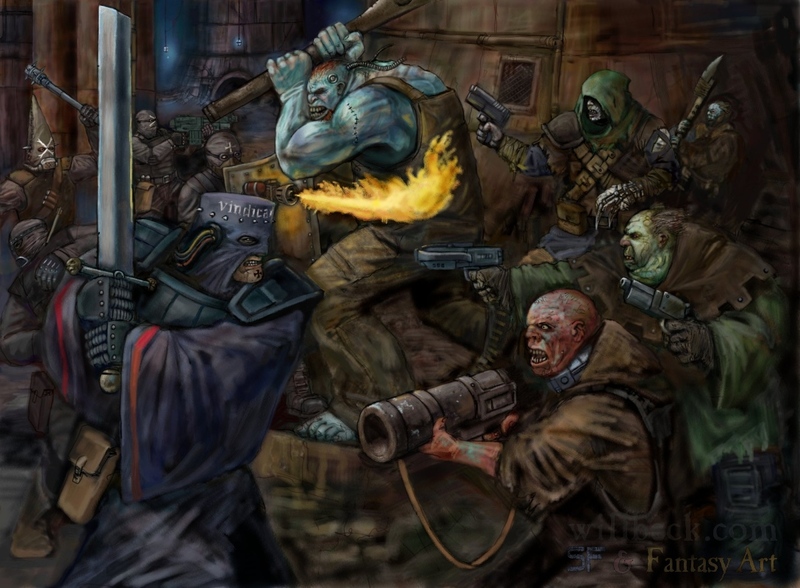 From this first look the game itself seems to be just a flat board game; completely ignoring the main reason people liked the Necromunda game in the first place: A fast competitive skirmish, with each side using under a dozen gangers a side and an vertical element to the gameplay and scenery. 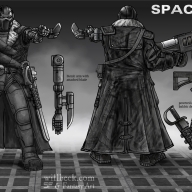 What GW will bring out to support this remains to be seen; the pessismist in me says they will just ask you to buy the Adeptus Mechanicus scenery they brought out for Shadow War Armageddon. 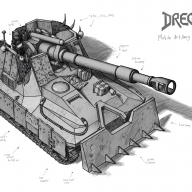 What I’d like to have seen is similar to the original set, with the new de-bossed cardboard for the flatter areas (as in the original game) with new plastic bulkheads, ladders and maybe some objectives and with a game-mat for the ground, all for under £150. 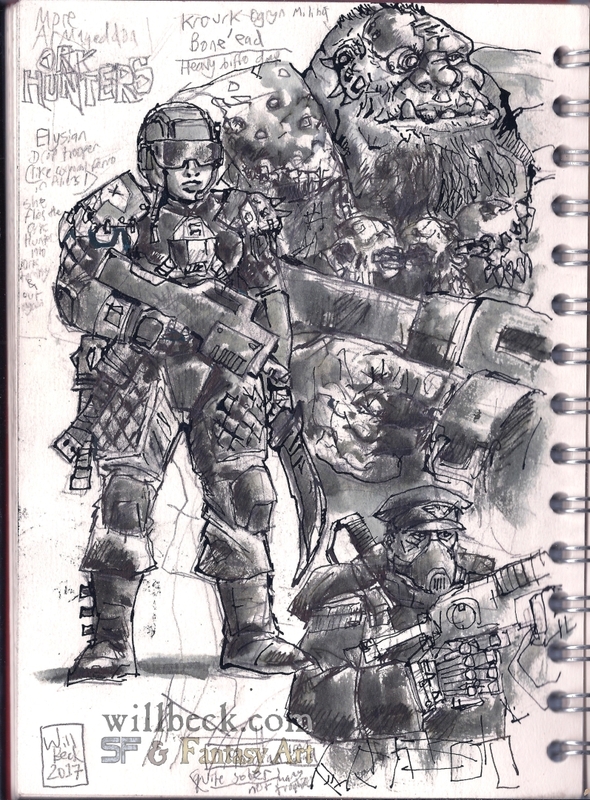 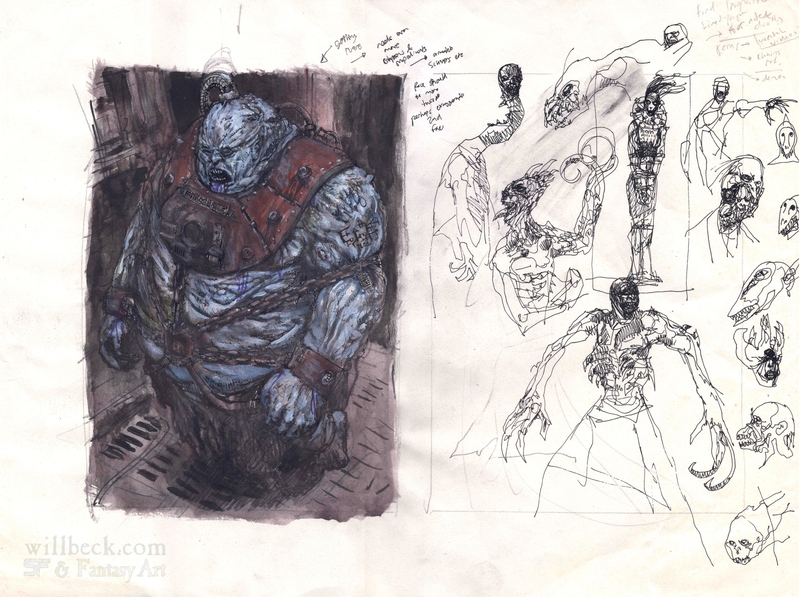 On that wishful note here are some more pages from my Necromunda Underhive sketchbook. 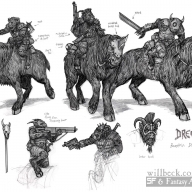 These are my first ideas for the symbols for the various house and gangs, with a Catoblepas riding beast conversion idea for a Rogue Trader’s entourage (Catoblepas entry on Wikipedia). 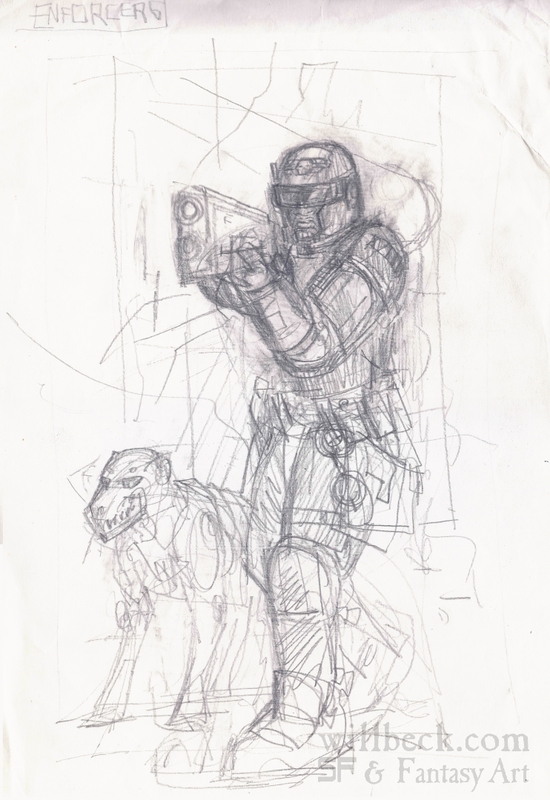 There’s also a Scavvy Scaly with his scattergun. 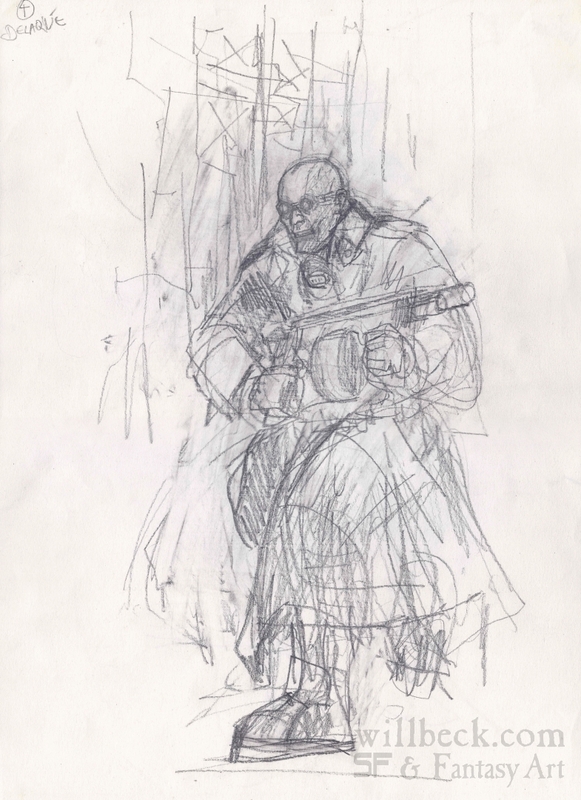 Some ideas for a border for the Underhive website, some scenery and colour options to do for the Redemptionist portrait. 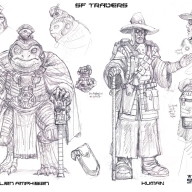 Nomad image plans and Ratskin portrait and weapons designs. 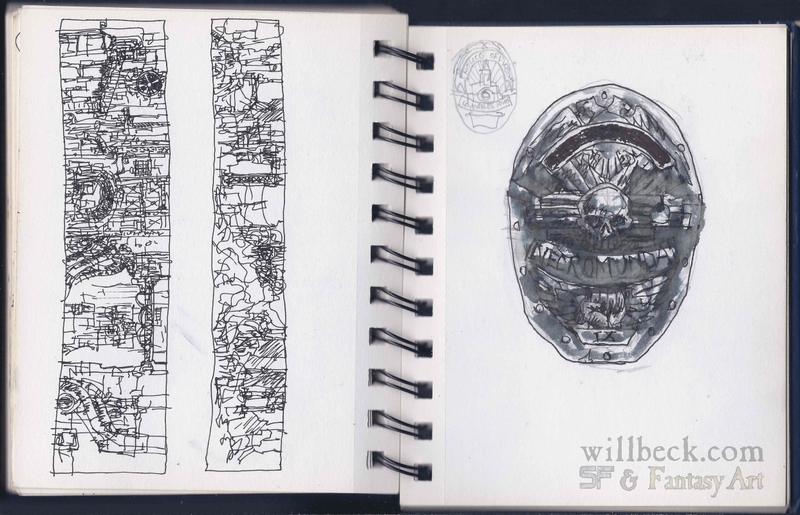 More underhive banner textures and my idea for an Enforcers symbol, with an Art Deco look based on the LAPD shield design. 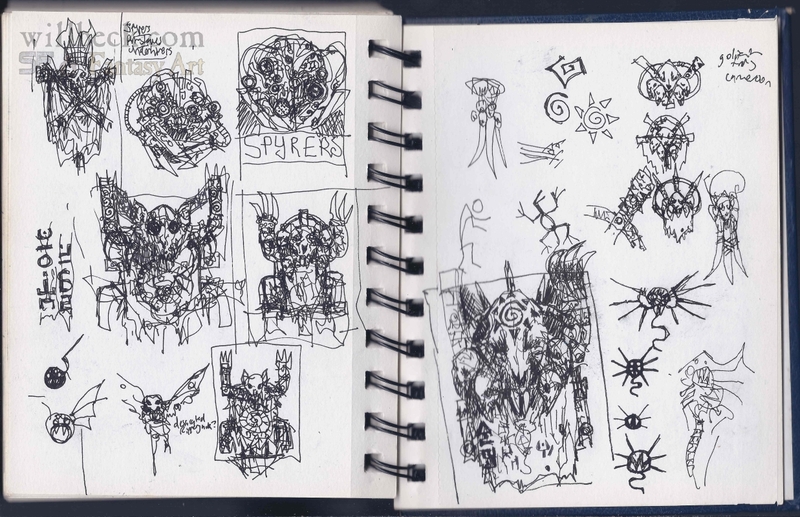 On these pages I was doodling symbols for the human rebel force I was converting and painting. 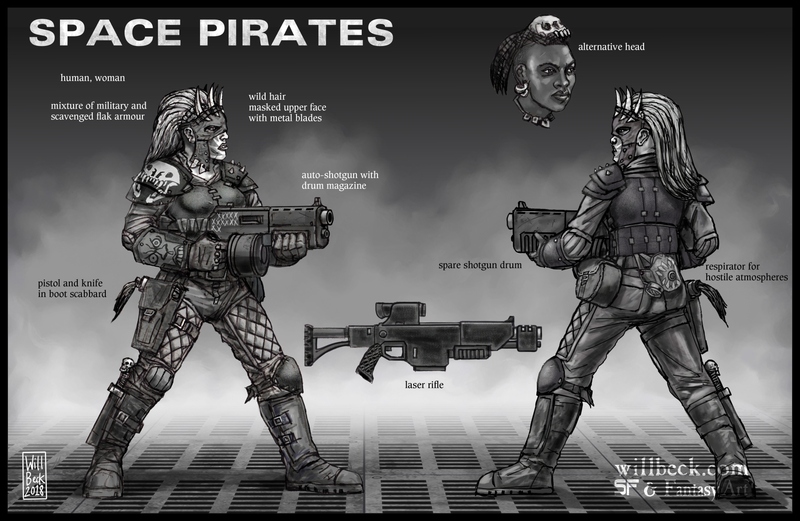 I wanted a design for humans rebelling against the fascist Imperium which was small enough and simple enough to paint on a 28mm miniature. 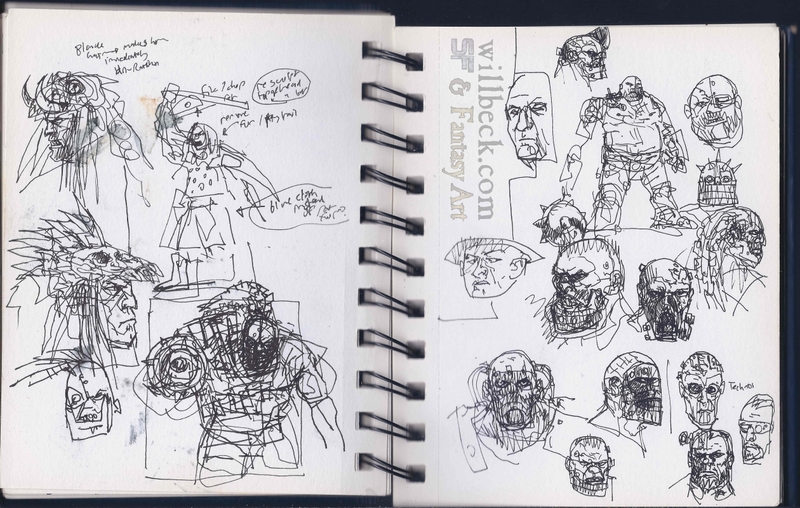 More of this sketchbook tomorrow! 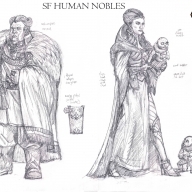 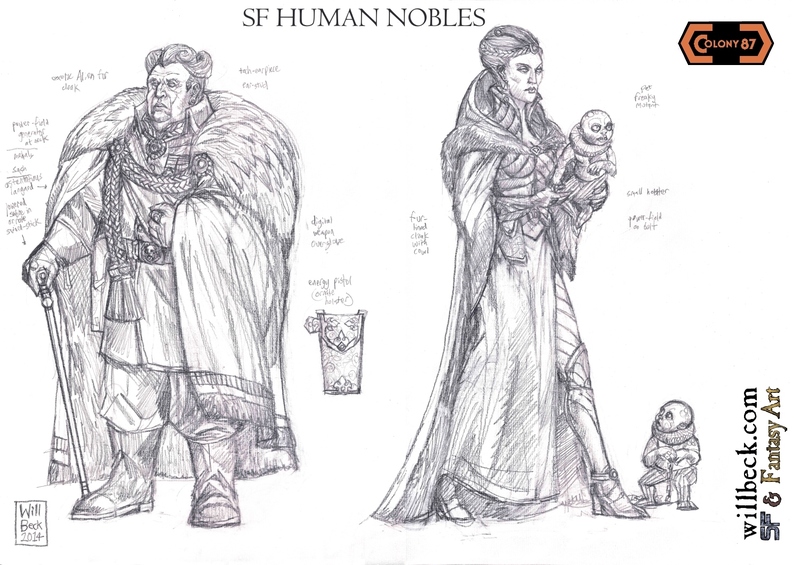 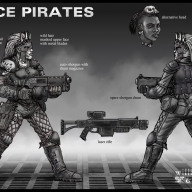 As always with these images, they’re fan art and not intended to breach Games Workshop’s intellectual property. 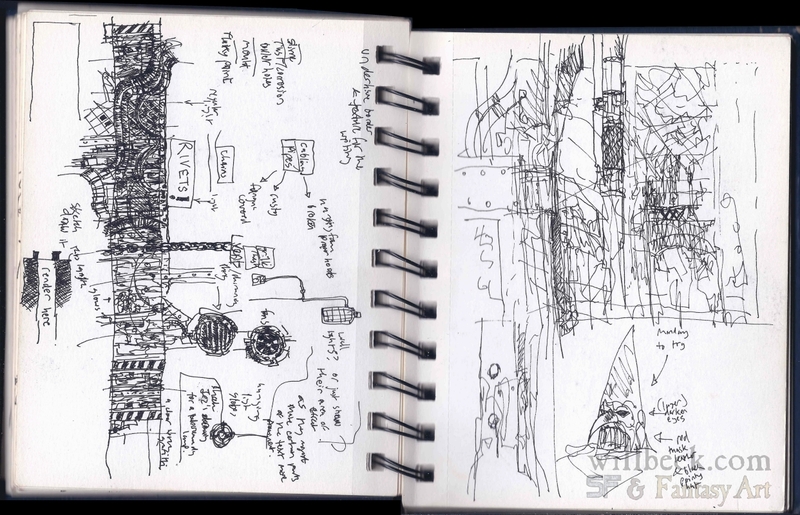 I promised a diversion but it’s really still following the same subject! 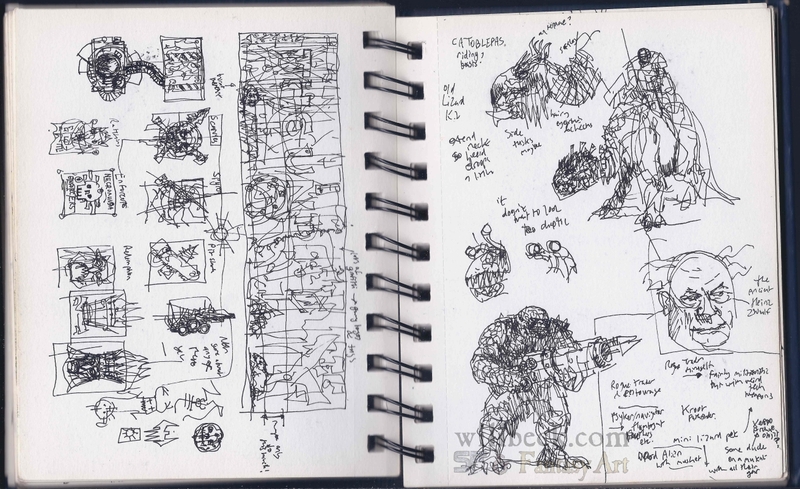 I had this idea when Games Workshop brought out Shadow War:Armageddon a few months ago. 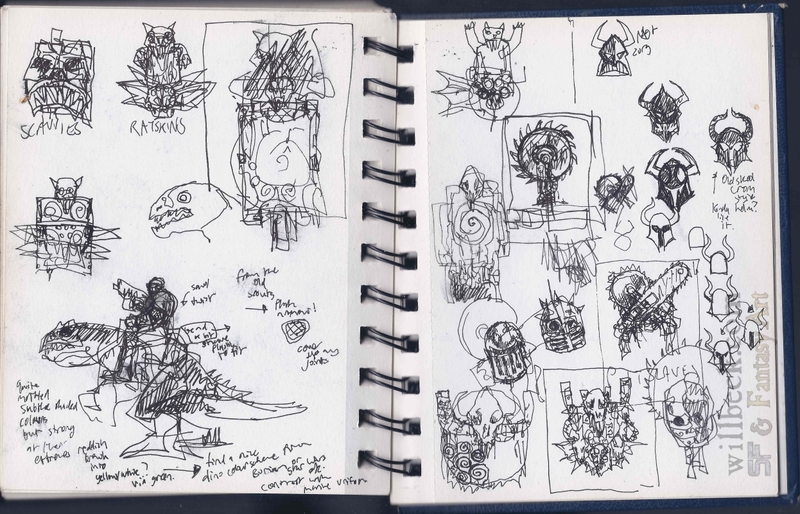 The box contained some OK scenery (though pricey and rather heavy on the skulls and Adeptus Mechanicus symbols! 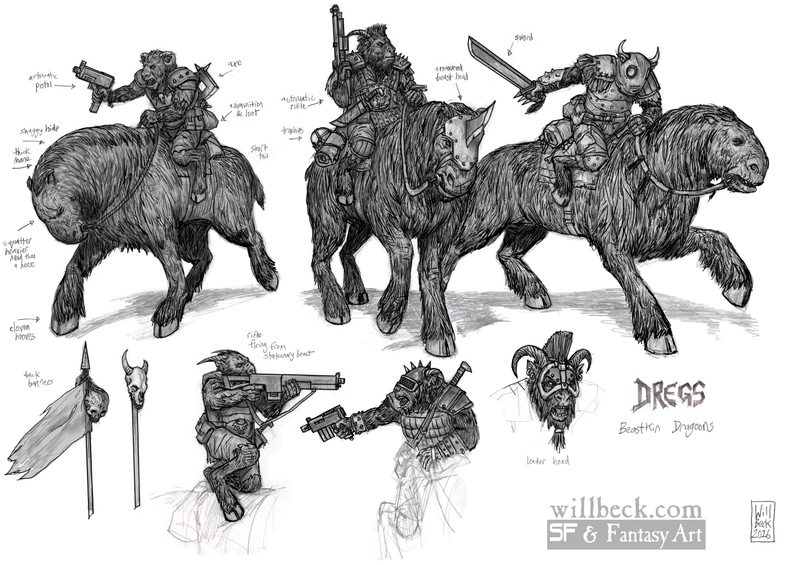 ), some Space Marine Scouts and Ork Boyz and the welcome return of the Necromunda rules. 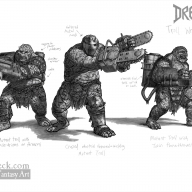 Now I suspect not many people bought it for the Scouts and Orks as these were kits that came out years ago, more wanted just the scenery and rules. 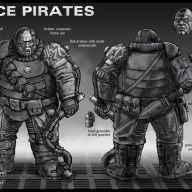 There was an opportunity missed I feel to show the Imperial Guard (Astra Militarum) and Ork players that they haven’t been forgotten and bring out some plastic Armageddon Ork Hunters for the Imperial Guard and Ork Kommandos for the Orks. 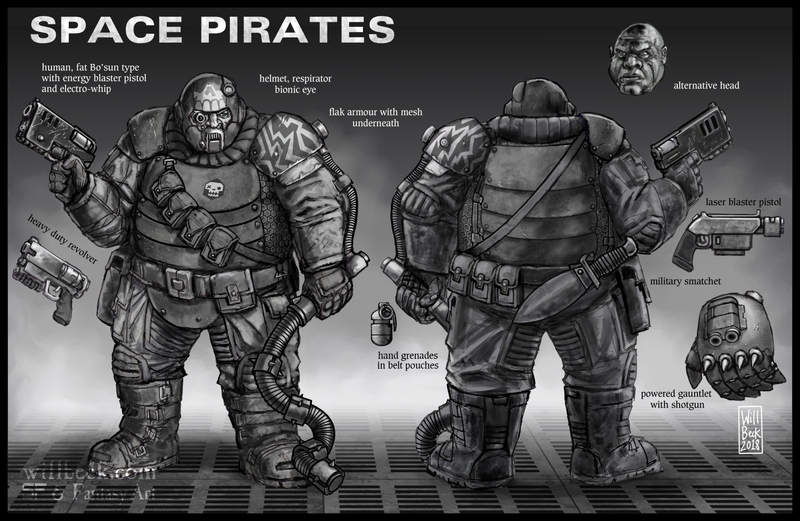 Here are my ideas for the Ork Hunters, they could have just been an upgrade sprue with a standard Cadian or Catachan Command sprue with few special characters in the same way they had in Deathwatch Overkill. 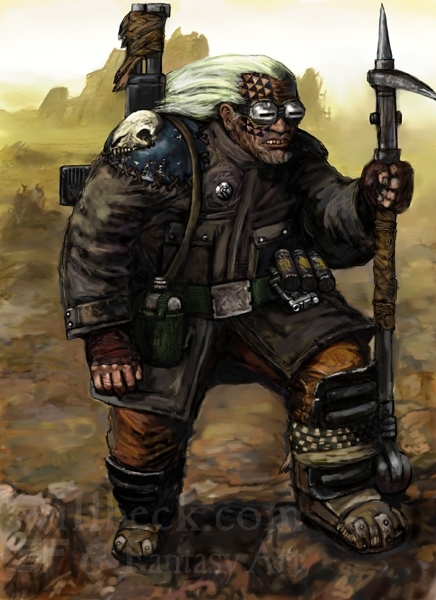 I looked at which Guard divisions served on Armageddon and created a motley bunch of expert Ork Hunters, kind of like a Warhammer 40,000 Bad Company (an old strip in 2000AD Bad Company comic on Wikipedia). 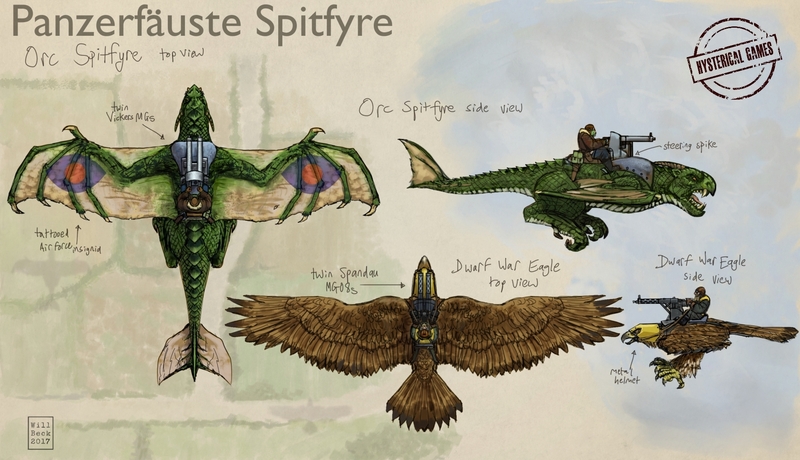 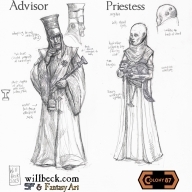 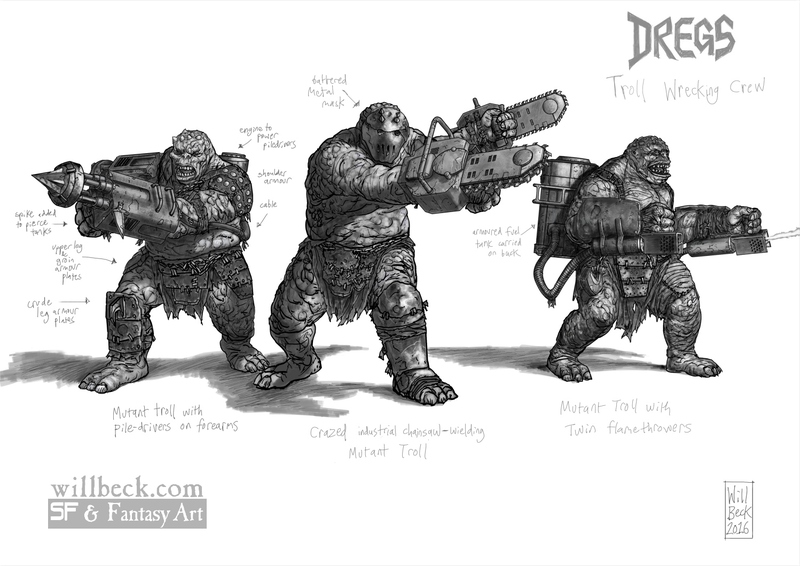 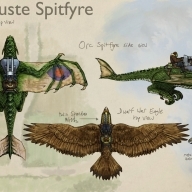 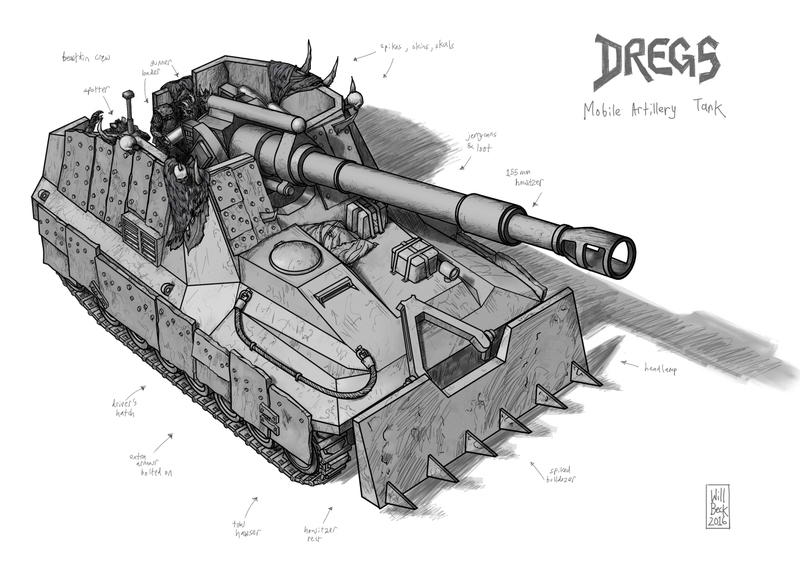 Again this is all fan art and not intended to breach Games Workshop intellectual property. 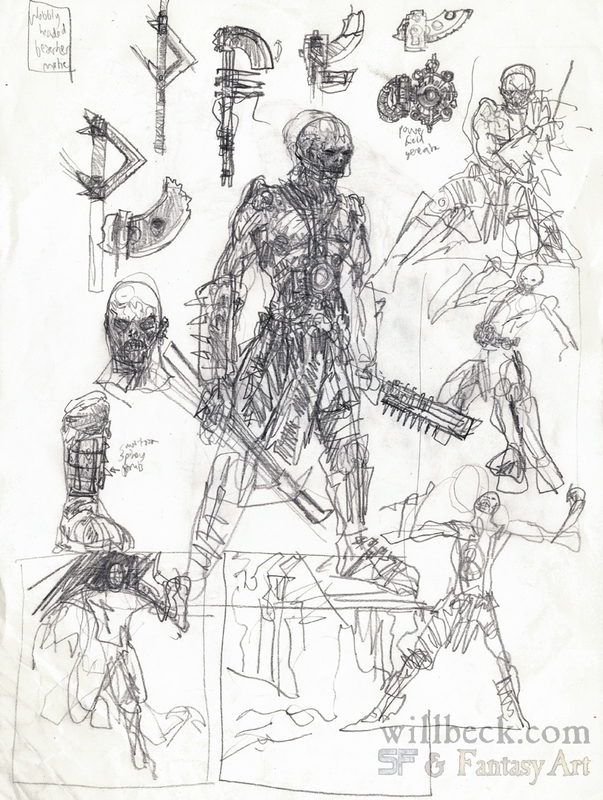 Not many people look at this site anyway. 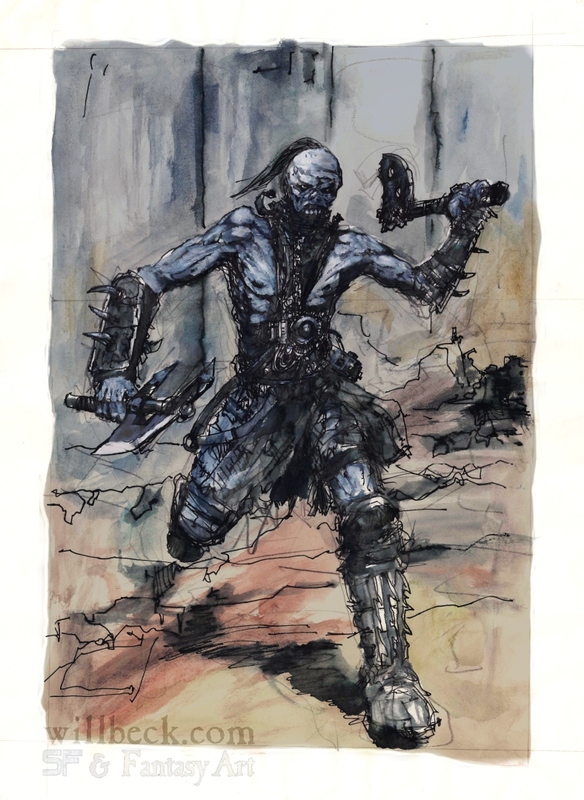 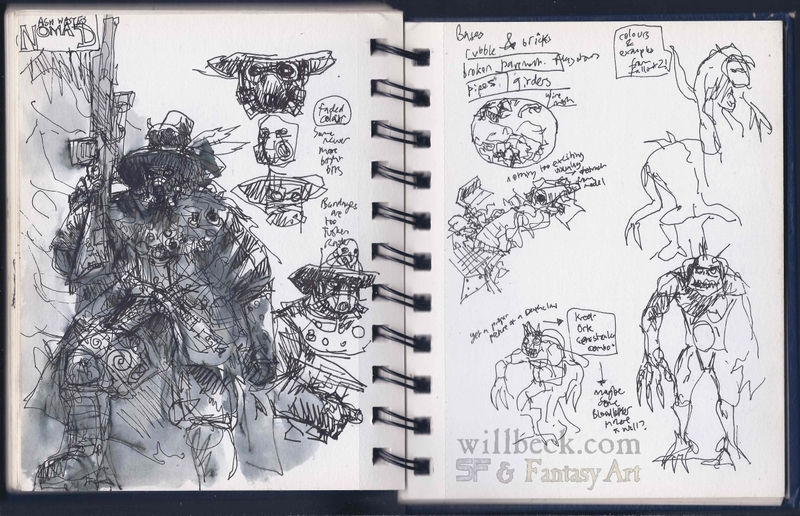 Here I’m planning a conversion of a Mike Perry Ratskin miniature followed by some character ideas for a Pit Slave gang. 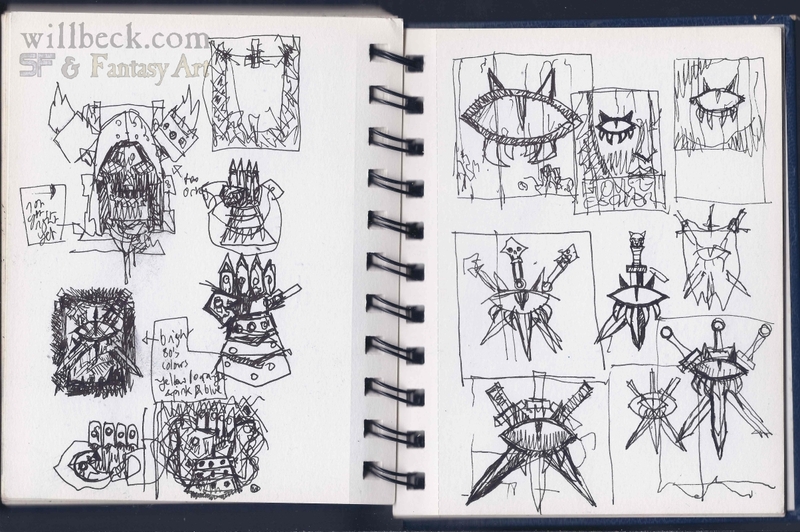 I’ve settled on the design of my Scavvy, with some more sketches for a whole bunch of them. 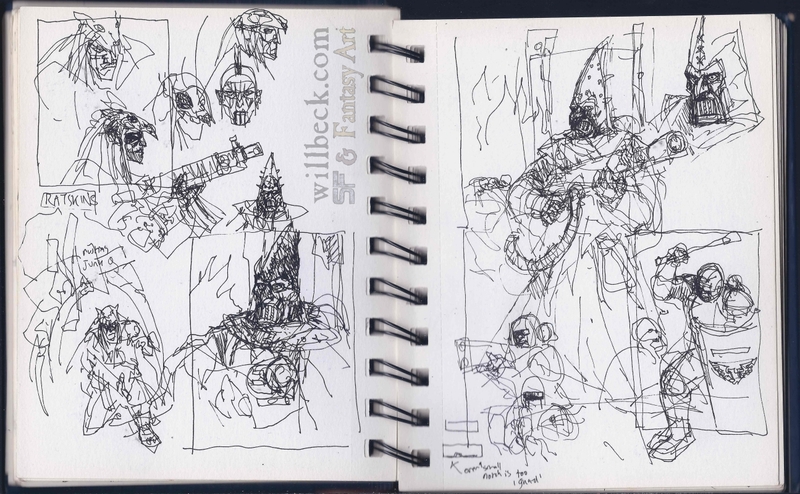 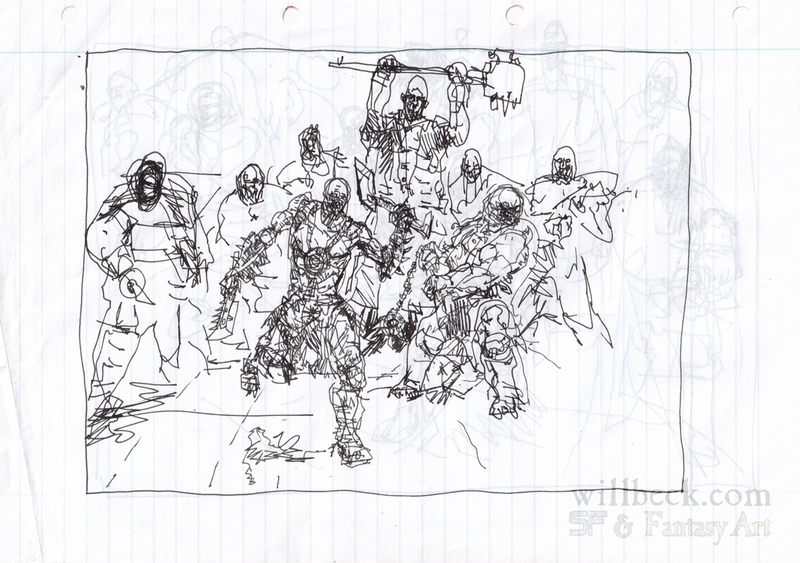 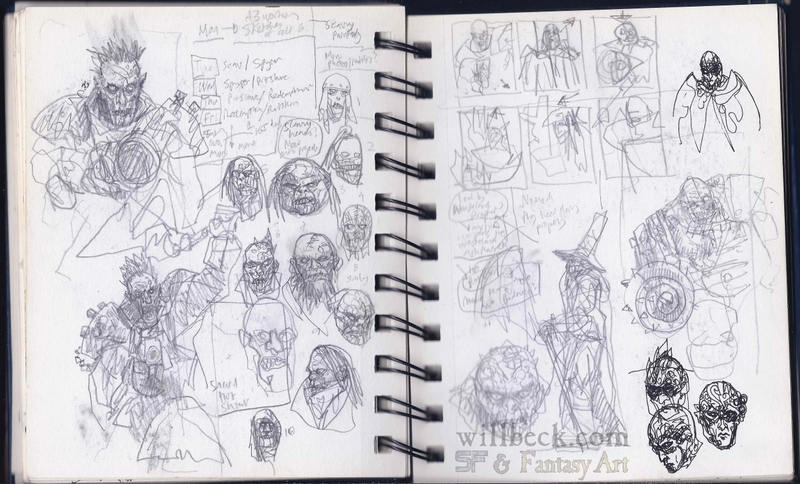 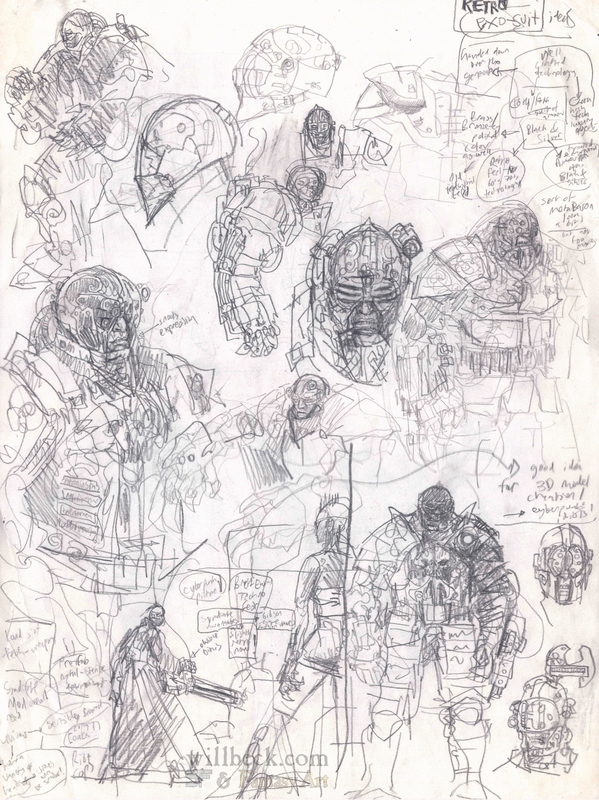 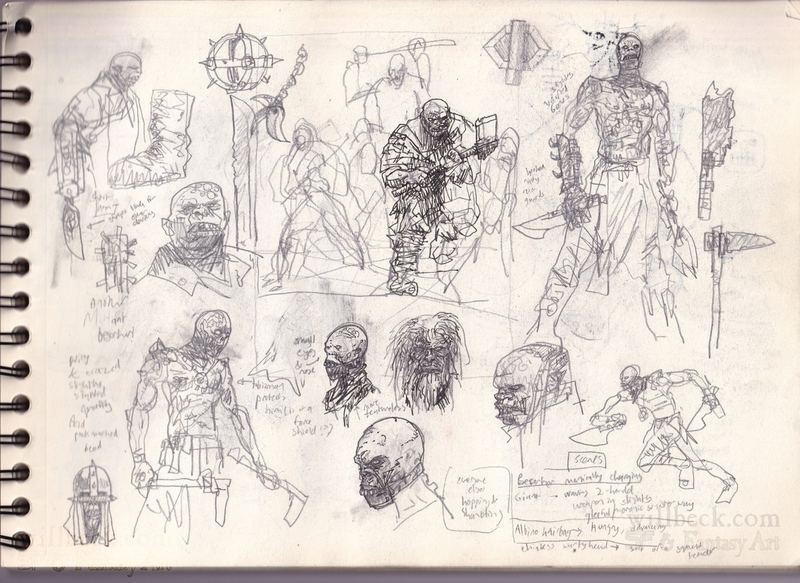 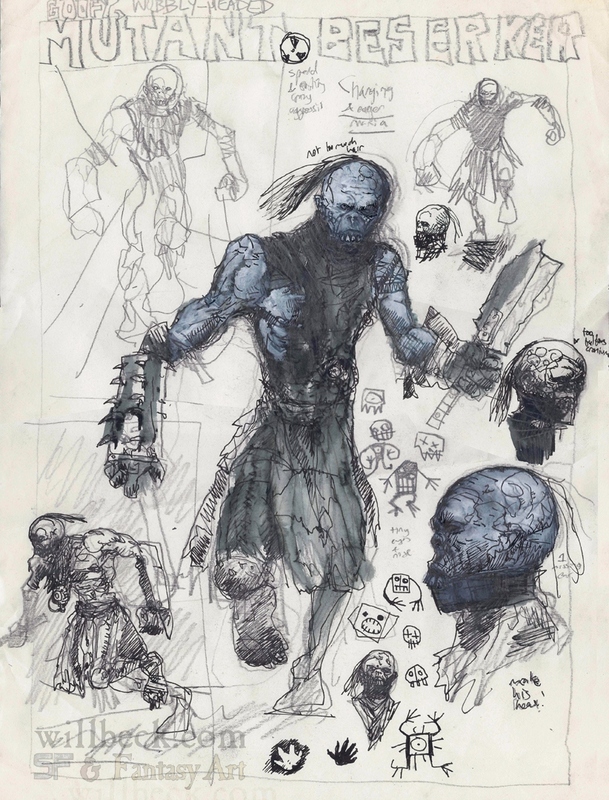 On the opposite page are some thumbnails of the other Outlander gang portraits, a Scaly, a Nomad and another Pit Slave. 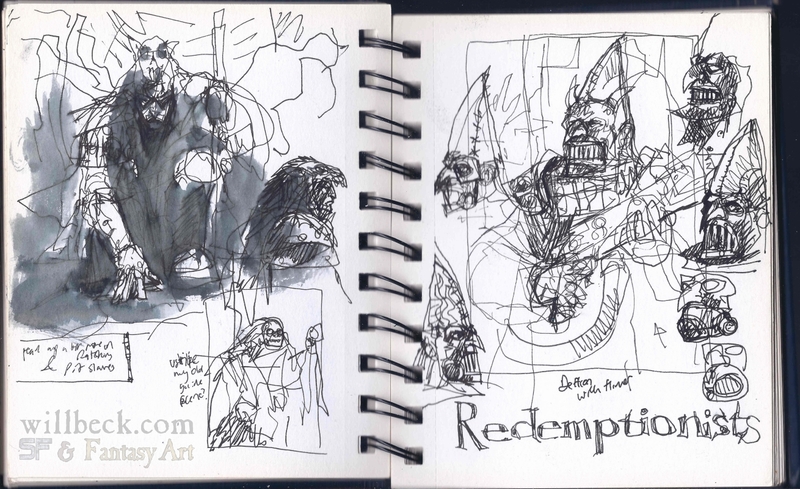 Ratskin portrait and the Redemptionists are progressing on these pages. 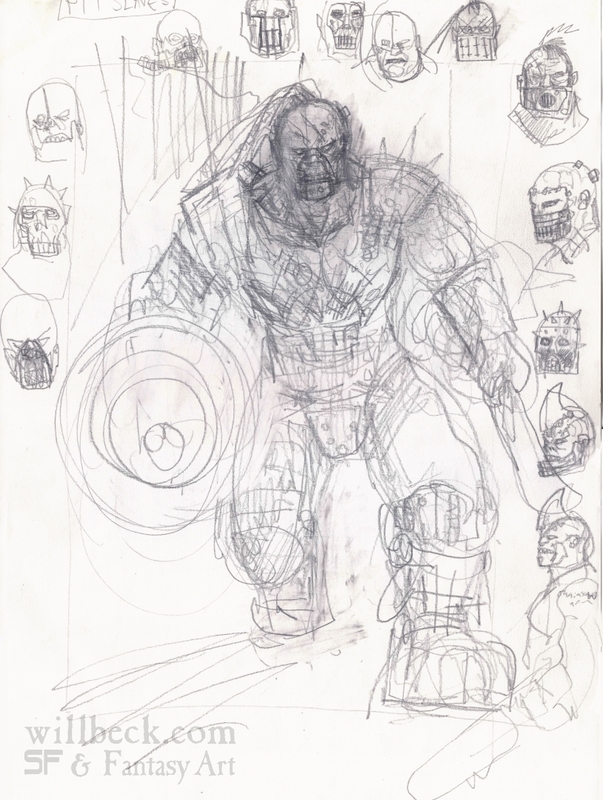 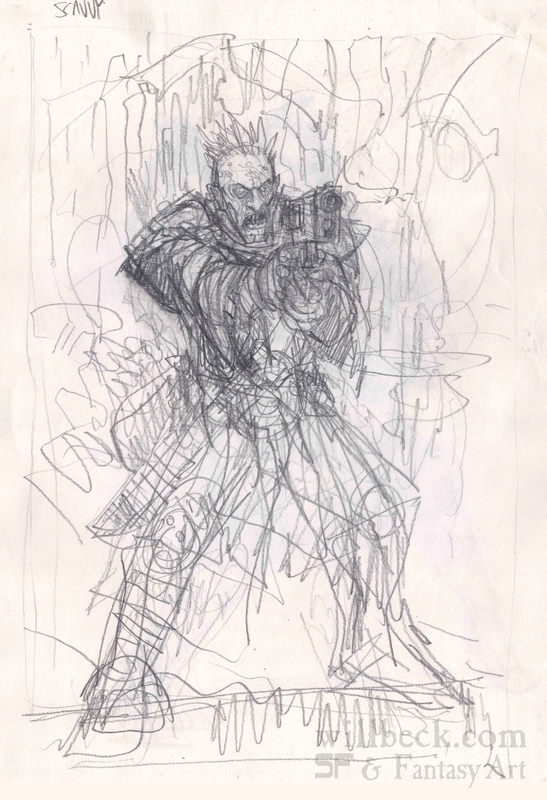 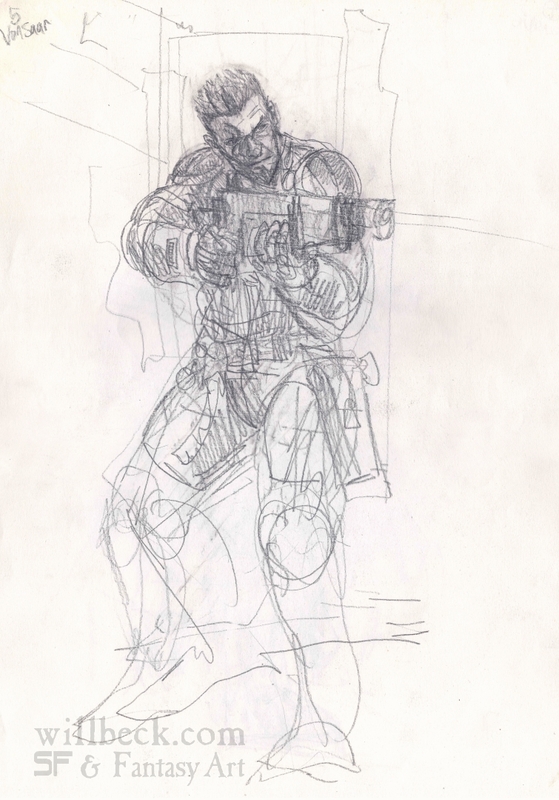 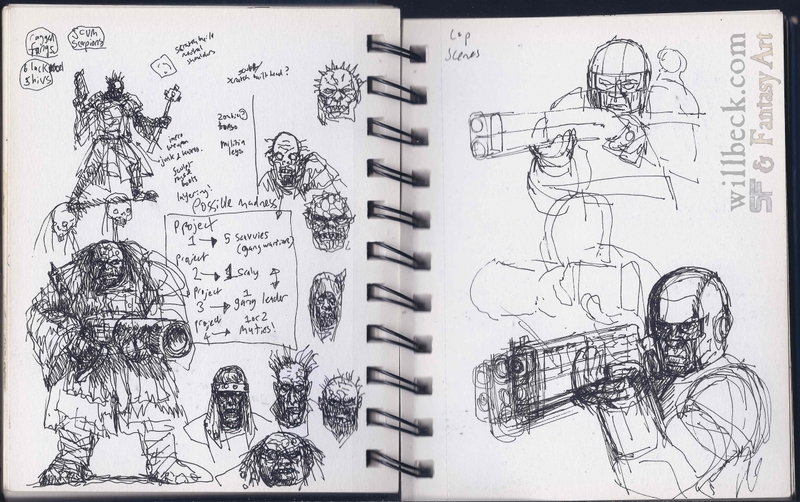 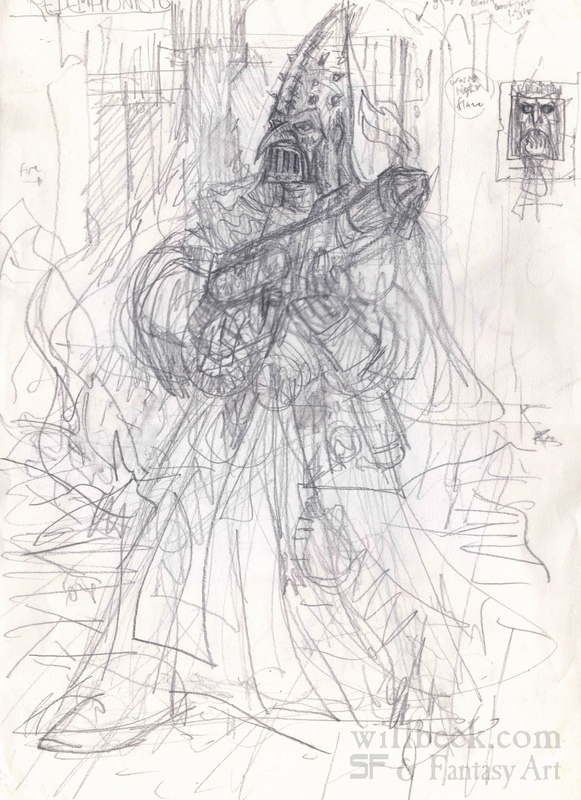 Here are more crazy plans for scratch-building an entire Scavvy gang and the pose I chose for the Enforcer portrait. 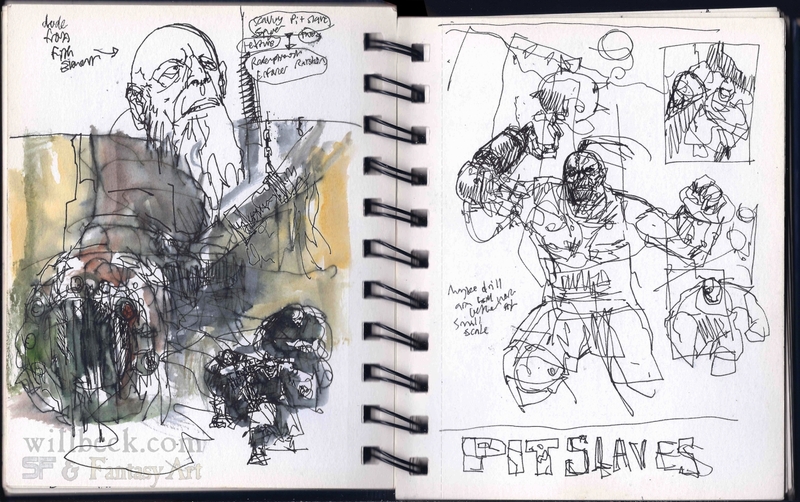 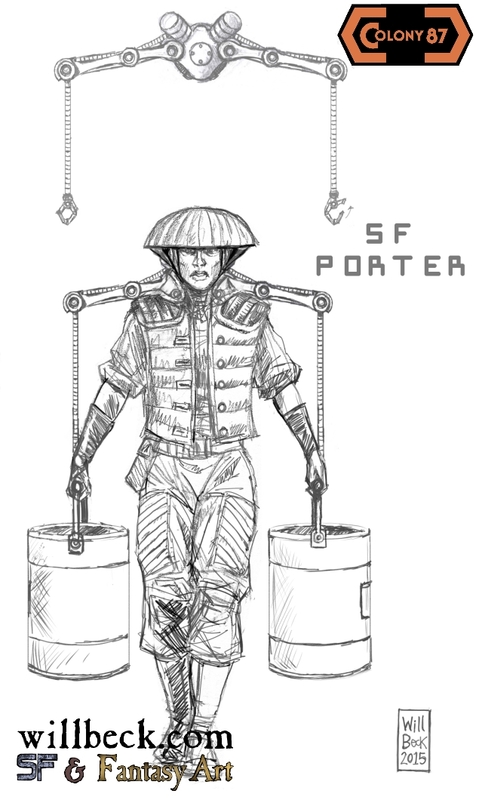 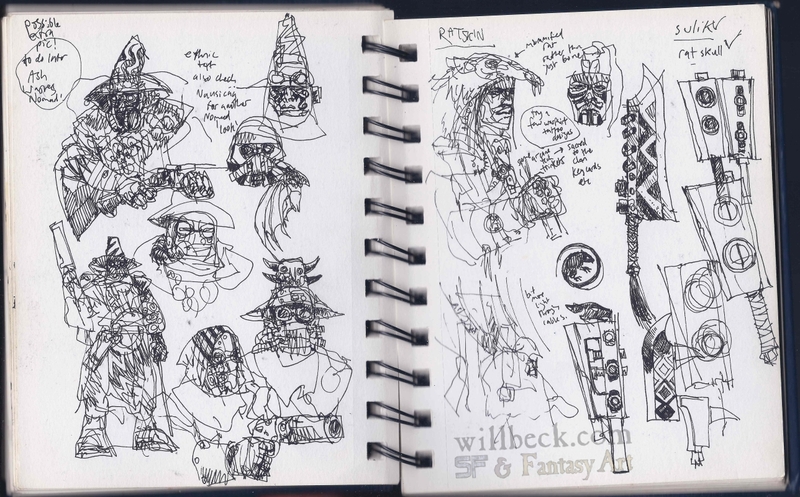 Though I’ve scanned the entire Underhive-themed sketchbook I may post something a bit different next time!